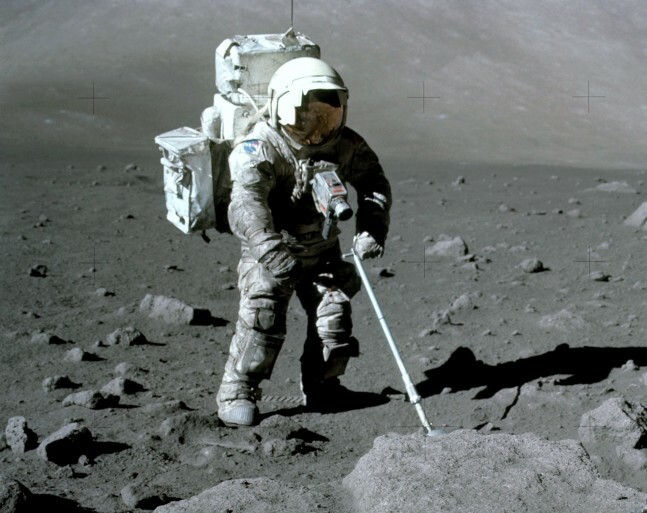 Future missions to the Moon will have to deal with the serious problems caused by Moon dust. The fine electrostatic dust which covers the lunar surface is very sharp and clings to surfaces. The abrasive dust can damage camera lenses, solar panels and other equipment, and even wear through multiple layers of an Apollo spacesuit. 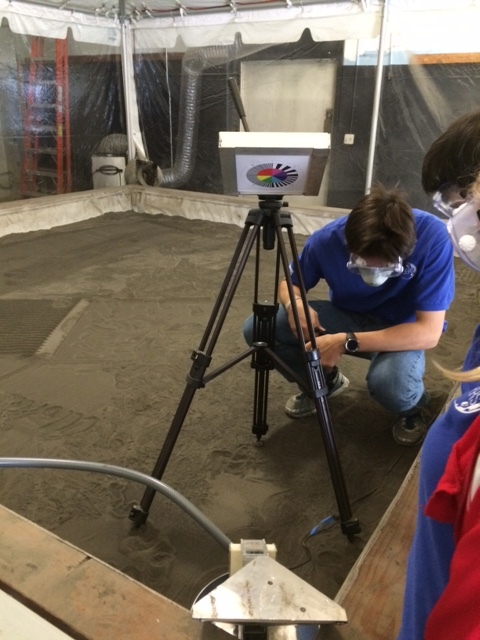 A group of students from Kealakehe High School on the Big Island of Hawaii recently spent three days at NASA Ames Research Center testing an electrodynamic dust shield (EDS) in the center’s Lunar Regolith Simulant Test bed. The test was host by NASA’s Solar System Exploration Virtual Institute (SSERVI) which is headquartered at Ames. Moon Research Investigating Dust Expulsion Removal Systems (Moon RIDERS) is a project partnering two Hawaiian high schools with NASA, Google Lunar X PRIZE teams, and the Pacific International Space Center for Exploration Systems (PISCES) – a Hilo-based aerospace agency of the Hawaiian state government. The goal of the program is to develop and test and EDS system that will be flown aboard a Google Lunar X PRIZE lander in 2016. PISCES selected two high schools to participate in the program – Kealakehe and ‘Iolani High School in Honolulu. Both teams built full-scale mock-ups of lunar landers outfitted with an EDS device. In March, the teams conducted two days of field-testing with their landers on the lower slopes of Mauna Kea, which has been used for lunar testing and training since the Apollo era. The Kealakehe Moon RIDERS team spent March 30-April 1 conducting laboratory tests using the Lunar Regolith Simulant Test bed at NASA Ames. 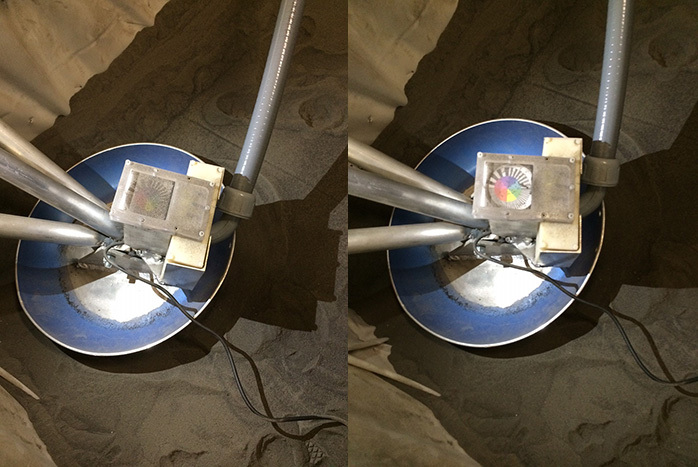 The test bed is 4 meters by 4 meters by 0.5 meters and is filled with 8 tons of JSC-1A regolith simulant. The test bed was originally constructed for NASA’s 2009 Regolith Excavation Challenge. The EDS device that the students tested is the culmination of several years of NASA research and development. The system both removes and repels lunar dust using a high-voltage, low-current device made up of three spiral electrodes. When activated, the device repels the dust in a ripple pattern, beginning in the center of the device and moving to the outer edges. One of the team leaders is senior Zachary Kineshiro. He worked on fabrication for the project and the GoPro camera systems that were used for data acquisition. “My favorite part of the project was learning about systems that I hadn’t used before, like the GoPros,” Kineshiro said at a media event on the final day of testing. Senior Amy Lowe is the head of computer-aided design, or CAD, for the project. She is also interested in the use of lunar dust as a construction material for 3-D printing habitats and other structures on the Moon. Amy designed the Moon Riders logo. The design features eight circles of different sizes that represent both grains of lunar dust and the eight islands that make up the state of Hawaii. “What I enjoyed about the project was the level of communication with experts and scientists at NASA,” Lowe said. In addition to their research work, the students also do educational outreach to children. This work includes organizing Kona STEM Camp, a 3-day educational camp for students in grades 3-8. “We want to use our awesomeness that we learned through this experience to show others what they can do too,” said senior Kyla B. Hollis.